So you’ve been busy this year and haven’t made those New Year’s resolutions yet? Don’t worry, I have you covered! The post-holiday season is the perfect time to start fresh by re-evaluating marketing strategy, forming new good habits, and kicking bad SEO practices to the curb. 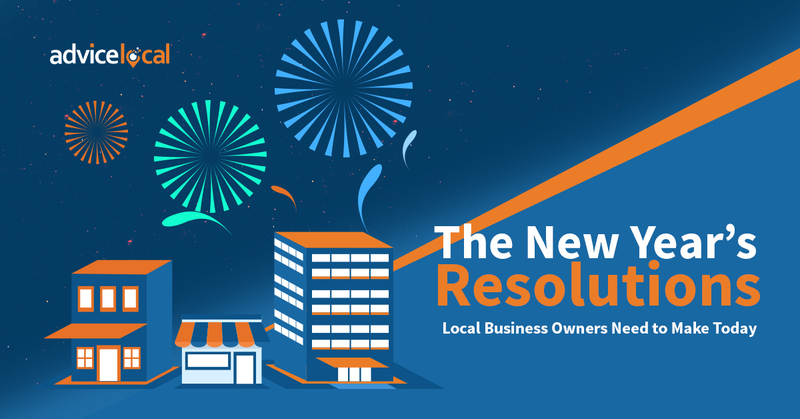 Nothing makes me happier than to see a small, local business succeed, so here are my top six New Year’s resolutions to help do just that. Set the business up for success in 2017 with well-defined goals and a clear plan for accomplishing them. Think about what the business can achieve this year that will drive leads and profits, whether it’s increased social media engagement, an improved mobile presence, or positioning the brand as an industry expert through high-quality blog content. Make an effort to refer to these primary goals when making any major marketing decisions in 2017 and beyond. Many business owners are guilty of neglecting their business listings, which leads to dirty citations. Yes, that bad data I’m always talking about that damages a local business’s online presence. If the small business you manage is overdue for citation cleanup, start the year off right by updating any old or incomplete business listings. Here’s a free guide to get you started. High-quality citations with up-to-date information can build the business’s local presence online and make it easier for customers to get in touch. When evaluating citation sources for accuracy, focus on ensuring the business’s name, address, and phone number (NAP) data is consistent across the web. Consumers use their smartphones for everything, from reading reviews to searching for nearby stores to making payments on-the-go. Businesses of all sizes should make a concerted effort to prioritize mobile customers this year – if they aren’t already doing so. Optimize the business’s website design, location landing pages, and online presence in general for mobile search. Update your website copy and SEO to factor in the growing popularity of voice search. If the business still doesn’t have a smartphone app, it’s easier than you might think to create a branded mobile app in minutes. Businesses and customers are always connected thanks to mobile devices and social media. It only makes sense to get more personal with consumers and allow them get to know the face of the business. Use social media to show customers a behind-the-scenes peek at the company, engage in online conversations, dabble in live video broadcasts, and get creative in showing off the brand’s persona or even the business owner’s personality. Be sure to remain authentic, human, and true to the brand values. Community involvement builds goodwill and helps a local business gain brand exposure online and off. Sponsoring a community sports team, parade float, or food drive benefits the community at large and earns authoritative backlinks from the organization’s website. These high-quality, local links can improve SEO and increase the business’s visibility. Plus, it feels good to give back! It’s important to focus on implementing and measuring marketing initiatives over the course of the year. You won’t experience results immediately, but consistency will pay off in the long run. For a local business, this might mean publishing regularly on the company blog, maintaining an active social presence, tracking downloads and subscriptions, and striving to grow other forms of engagement across all platforms. Whatever metrics matter most to the business, be sure to track those. Most importantly, remember that consistency and persistence are crucial to keeping your New Year’s resolutions. Start capturing every moment and capture consumers in their moment of need. Tell me about your resolutions! How will you keep on track in the new year? Be sure to come back for more local business tips from the #QueenofLocalSEO next week.